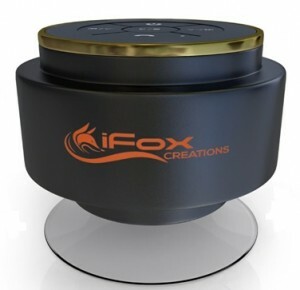 The company who created the iFox Creations Bluetooth Shower Speaker is as you may have figured is iFox Creations. You may not be familiar with who they are as they are only a small company who sell consumer electrical goods, but that doesn’t mean their products or service should fall short of excellence in any way, shape or form. They do pride themselves on customer service as they realise how important it is especially for a small company that is striving for growth. iFox Creations tries to differentiate themselves from their competitors by producing products that are unique and different from others. 3W speaker that is capable of a fairly loud maximum volume. Wireless range of up to 10 metres. Completely waterproof that is capable of surviving in water up to 3 feet deep. Power suction cup that can be attached to glass, ceramic or any other smooth surface. Battery life of up to 10 hours which only takes up to 3 hours to fully recharge. Connect wirelessly to any Bluetooth enabled device such as: A phone, tablet, laptop, MP3 Player or smart TV. The speaker controls not only allows you to change tracks, adjust the volume, pause/play but with the built-in microphone you can also answer phone calls. Small, lightweight and portable so you can take it anywhere with you. Never miss a phone call with the built-in mic, you can take this speaker with you in the shower or bath and you won’t have to worry about getting the speaker wet or dropping it in the bath. The waterproof function means you can carelessly use the speaker in any environment where it may get wet without having to worry about it not working. Good wireless range allows you to take the speaker away from the paired device and still control the music or take phone calls with the handy speaker controls. This speaker is slightly overpriced compared to what other Bluetooth speakers you can buy for the same price or less. But if you make use of the waterproof feature then it’s worth the money. Although the maximum volume is pretty loud the sound quality does suffer slightly when you have it on the maximum volume. If you have it just below the maximum volume then the sound quality should be fine. Not a major problem but this speaker has no aux socket to connect devices via the 3.5mm audio jack. If you’re comparing just the sound quality of the iFox Creations Bluetooth Shower Speaker to other Bluetooth speakers then there’s room for improvement for this speaker. 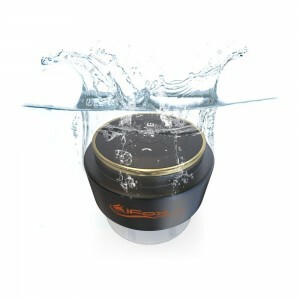 But if you’re comparing the overall package then this speaker is competitive mainly because of the waterproof capability. Speakers such as the August MS515 has better sound quality but is not waterproof. It really does depend on what you’ll mainly be using this speaker for to see if it’s worth buying. The combined waterproof capability with the built-in microphone does make it quite a diverse Bluetooth speaker as you can see iFox Creations has tried to cover as many angles as possible.